Induction cooking is taking the world by storm. The benefits that come when cooking with induction stovetops are enough to convince the average person to make the switch. Firstly, it’s highly efficient and eco-friendly since it uses very little energy to heat up your pan and get it ready to cook. It doesn’t radiate as much heat as other cooking methods do and the actual stovetop stays cool to the touch during cooking. This makes it a safer option especially if you’re a klutz in the kitchen like me! An induction stove is also said to heat the stovetop up much faster than regular gas or electric stove, thereby saving you precious time in the kitchen. If you have already decided to make the switch to the induction stovetop, you must keep in mind that not all of your existing pots and pans will be compatible with your brand-new stovetop. Induction cookware uses electromagnetic technology to operate which is why the cookware that you use needs to have a base made of ferromagnetic material. In simpler words, if a magnet can stick to the base of a pan, it’s appropriate to use on an induction stovetop. If your existing frying pan is not induction compatible, you’ll need to get a new one for that egg and bacon breakfast! We have reviewed and compiled a list of the best non-stick frying pans for induction cooktops for you to choose from. The T-fal Nonstick Fry Pan is 12 inches in size and comes with T-fal’s famous thermo-spot heat indicator. The spot on in the middle of the pan changes color from black to red when your pan is sufficiently heated, eliminating guesswork from your cooking. Any cook knows that the secret to a perfectly seared moist piece of meat is in the cooking temperature which is why the thermo-spot feature is really helpful. The pan is made of a heavy-gauge aluminum core making it heat conductive and providing fast, even heat-up. The stainless-steel base is warp-resistant and makes the pan induction compatible. The cookware is free from PFOA, Lead and Cadmium which makes it a safe option. 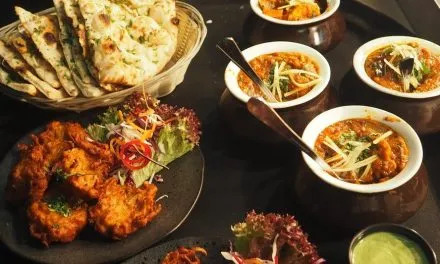 The manufacturer has termed the non-stick technology as ‘Pro Metal’ which means that the non-stick coating is scratch resistant and safe to use with metal utensils. As with all good quality non-stick pans, you need to use very little to no oil or butter when cooking. The non-stick surface makes it easy to cook and slide food off the pan and into the plate. The clean-up is also relatively simple, just wipe with a clean paper towel or if required, wash by hand with dish soap and water. Although it’s dishwasher safe, it’s always best to hand wash your non-stick cookware in my experience. The pan comes with riveted silicone handles that stay cool to the touch and provide a comfortable grip. It comes with the option of a tempered-glass lid with a small steam vent which makes it easy to monitor food progress and also helps trap moisture. You can use the pan for frying, browning, searing and sautéing. It is a good companion to have when cooking breakfast or a small meal. You can safely use the pan in the oven as long as you keep the temperature under 400 degrees Fahrenheit. For optimal performance and longevity, T-fal recommends that you use the pan with medium heat and never allow liquids in the pan to completely boil dry. Also, make sure that your cooktop is level. Although there is a slight convexity in the pan’s surface, it does not affect the even heat distribution of the pan and gives a great performance. This Copper Chef frying pan comes in a fun square shape along with their signature copper look making it a good addition to your collection of pots and pans. The pan is 9.5 inches and comes with a glass lid for versatility in cooking. The pan is made with copper which is the best heat conductive material out there making it extremely efficient to use. The ceramic non-stick coating is of superior quality and allows cooking with minimal or no oil. The quality core provides high durability so that the pan can be used for extended periods of cook time. The great thing about the unique square design is that it gives up to 25% more room to cook in when compared to ordinary round pans. Because of the highly efficient stainless-steel induction plate built into the saucepan, you don’t need to cook your food on extremely high temperatures. The pan distributes heat thoroughly and evenly to every corner giving your meal a perfect cook. The pan is dishwasher safe but as with all non-stick cookware, we recommend that you wash it by hand. The pan is free from both PTFE and PFOA and will not leach any harmful chemicals into your food. Even though it is made of copper, the outer layer prevents it from tarnishing or oxidizing like regular copper pans. You will not need to polish your pan to make it last. You can use any non-metallic utensil to cook in it such as silicon, plastic, wood or bamboo. My favorite utensils to use on non-stick cookware are silicon ones since I feel they tend to last longer and are also easy on the non-stick surface. The skillet is heat resistant up to 850 degrees Fahrenheit and you can use it to start your meals with a sear on the stovetop and end it in the oven. But be careful when taking out the hot pan from the oven since its metal handles can become hot. Use mittens or silicon pan holder. The tempered glass lid comes with thermal shock resistant technology and is shatterproof. 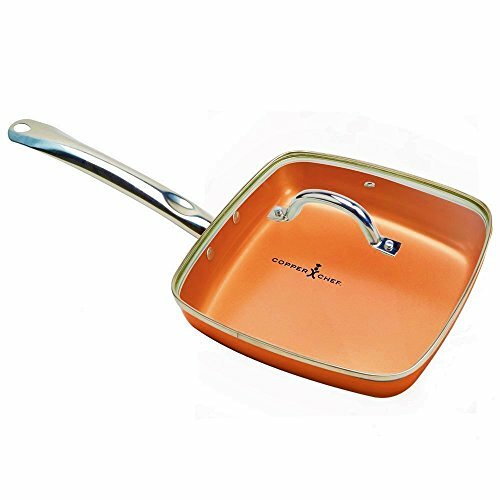 DURABLE SQUARE FRYING PAN: The 9.5 inch Copper Chef dance pan with glass lid is made of copper and non-stick ceramic. The quality core provides high durability so that the saute pan can be used for extended periods of cook time. The non stick surface is very slick, so food doesn't stick while cooking. Broil fish, fry meat, bacon, eggs, omelets, bake chicken, desserts, or whip cream. Unique square design gives up to 25% more room to cook vs. ordinary round pans. FEATURES: You may find you do not need to cook with the same high temperatures ordinary pans require. That is because the square deep fry saute pan with lids has an innovative, stainless steel induction plate built directly into the saucepan. It distributes high heat quickly and evenly to the entire cooking surface to perfect your steak, fish, omelette, pancake or anything you are craving for. Cleaning is hassle since the pan is 100% dishwasher safe. ECO-FRIENDLY MATERIALS: The CopperChef Square 9.5 inches frying sauce pan with lid will not oxidize or tarnish like traditional copper pans that need frequent polishing. It is of both PTFE & PFOA, and it is great for any non-metallic utensils made of wood, plastic, silicone, or bamboo. Cookware will not leach harmful chemicals into your food. fry pans are of toxic chemicals, so they are safe for kids and adults alike. OVEN SAFE: The nonstick ceramic skillet is heat resistant up to 850 F. allowing transition from stovetop to oven in one pan. Sear a steak on your stovetop, then bake to your desired degree of doneness ; all from the same pan. Sturdy helper handle on 9.5inch pan makes transporting your pan a cinch! Less cook time, less mess. 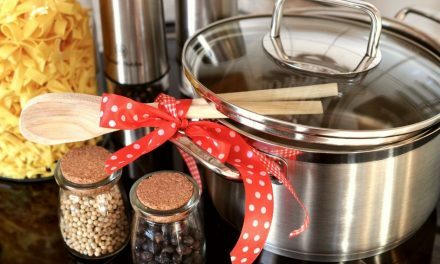 Theergonomically shaped metal handles on the cookware may become hot, so always exercise caution when using. TEMPERED GLASS LID: The beautiful glass lid allows you to keep an eye on your cooking, without losing heat. The lid provides faster cooking results by keeping foods hot. It is thermal shock resistant technology, there is no fear of shattering, and the ultra-durable design increases performance level. This 12-Inch nonstick fry pan from All-Clad comes with a wide flat base and a versatile low-profile shape. It’s 3-ply bonded construction consists of durable stainless steel with an aluminum core inside that guarantees even heating throughout the pan. 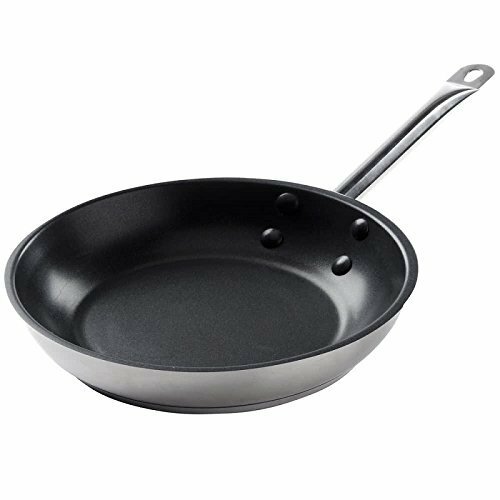 The pan is made from completely PFOA-free nonstick coating which comes with the durability and performance of any All-Clad product. The contoured handles made of stainless-steel are permanently secured by rivets which not only give it a beautiful sleek look but also give longevity and strength to your pan. A great feature with All-Clad cookware is that the pan’s capacity is etched on the bottom of the pan so you don’t have to guess how much food it can hold. The pan is safe to use in the oven with temperatures going up to 500 degrees Fahrenheit. The 18/10 stainless steel pan has an interior and exterior that resists warping and comes with a limited lifetime warranty from the manufacturer. TeChef non-stick pan comes with DuPont Teflon Platinum coating and is widely considered as the world’s finest frying pan for induction cooking. The frying pan is coated 6 times with Teflon, with a durable ceramic coating on the outside layer. The TeChef frying pan has a unique design that is capable of heating the pan evenly from the bottom by distributing the heat effectively. Its unique design allows it to be used with any sort of induction ranges. 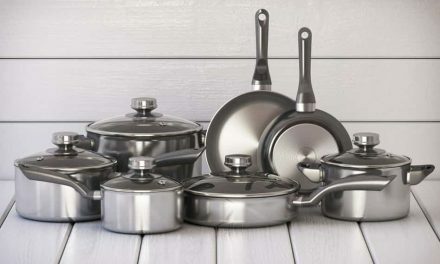 TeChef assures its customers that the cookware is free from any sort of defects or shoddy workmanship, and won’t develop any sort of defects until its useful life is over. The frying pan has an 8-inch diameter, which makes it perfect for frying pans or even pork chops. Because of its non-stick qualities, it becomes super easy to transfer food from the pan to the plate. The frying pan also comes with an 11-inch lid, which makes it easy to prepare food that requires minimum evaporation. What’s more, the frying pan is extremely easy to clean and can be rinsed with soapy water for effective cleanup. The price of the pan is pretty good for its quality, considering that there are 6 layers of Teflon. This frying pan is perfect for sautéing vegetables and meat before putting them into a dish being prepared. It can also be used for preparing pasta. After you have used the pan, you will hear certain pop and pings as it cools. This mainly happens because the metals expand when they are heated and contract when they cool down. 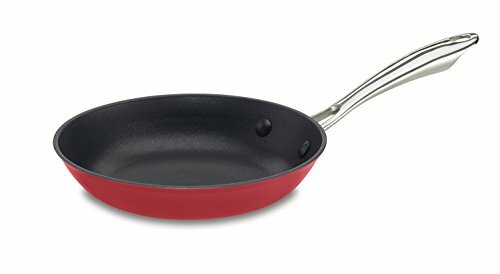 Cuisinart non-stick cast iron fry pan comes in an elegant red color and a classic cast iron build. This makes it a great frying pan for heat retention as well as heating. The exterior of this frying pan is made with porcelain enamel, while the handles of the pot are made with riveted cool grip handles with stainless steel plating. The frying pan is perfectly designed for preparing fried eggs. The base of the frying pan is quite heavy and quickly heats up on any sort of electrical induction range. Once the pan heats up, it is able to maintain its heat well. Even though it has a heavy base, its weight is still quite lower as compared to other cast iron frying pans. The handle is also designed to be quite comfortable, the rivets and edges of the pan are both coated to let the handle stay cool when cooking in intense heat. However, the handle of the pan is quite small which is why it may seem that the pan is a little heavier than it actually is. The non-stick feature of the pan also works really well, which also makes it easier to clean it after the food has been prepared. However, if you burn the food on the pan, then there is no need to worry. The pan has a scratch resistant surface, so any sort of scrubbing won’t affect the pan. The best thing about this pan is that it comes with a lifetime warranty, which is why it provides great value for money. This 11-inch stainless steel non-stick frying pan is also a great option for induction. It comes with a 7-gauge aluminum core, which allows even heating and extremely efficient magnetic conductivity, which is very important for induction cooking. The best thing about this frying pan is that it is NSF-listed, which means that it comes with great anti-corrosive properties and prolonged lifespan. This frying pan is designed to handle multiple tasks in the kitchen, such as sautéing cut meat as well as preparing omelets. This is why we can safely say that it is a pretty important utensil to have in the kitchen. Because of its 11 inch diameter, it is also suited to the needs of any professional kitchen in a restaurant. The outside diameter of the frying pan is a little over 15 inches, with the depth being 2 and a half inches. The 4-inch sides of the frying pan allows foods to be prepared without creating too much mess due to spillage. The size and shape of the frying pan makes it well-suited to the needs of any type of induction cooker. The size of the frying pan may seem a little larger than expected for some homeowners, but rest assured, the pan comes with a stainless steel base because of its high-quality coating. The bottom of the pan is also quite thick, which is why it never warps at a high temperature, something which is quite a big problem with other frying pans. The handle may look very plain, but you won’t have any sort of problems with transferring food from the pan into another container. All three pans listed in this review are not only my personal top choices but also greatly reviewed by anyone who uses them. Any one of them would make a great addition to your induction cookware set. 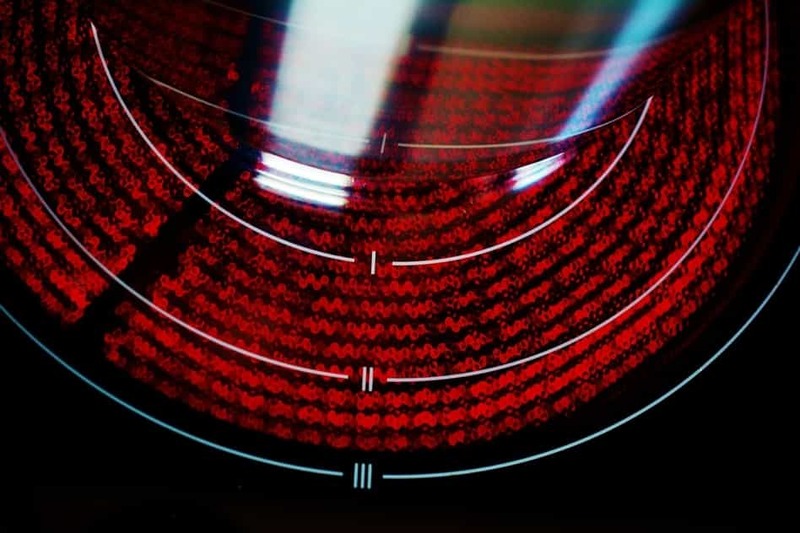 One important thing that you must remember is that electromagnetic fields are extremely important in induction cooking. This is why non-induction ready cookware won’t work on any sort of induction cooktop. 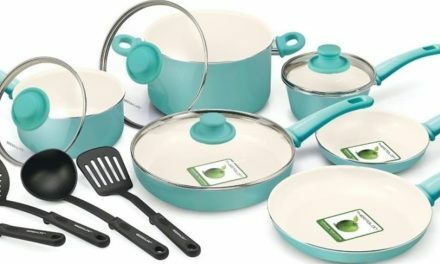 These usually include copper cookware, aluminum cookware, pyrex cookware as well as glass cookware. 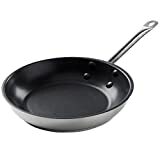 I hope this list helps you choose the best nonstick frying pan for your induction cooktop. Let me know if you found this helpful in the comments. At the end of the day, you can choose one that has the functionality that fits with your lifestyle and aesthetic. Happy cooking!